A former Scotland Yard police detective has denied deliberately hampering the Stephen Lawrence murder investigation in return for cash. Claims in a BBC documentary that John Davidson undermined the police inquiry are to be probed by the Independent Police Complaints Commission (IPCC). In a statement, Mr Davidson said he refuted the "devastating and false" corruption allegations against him. 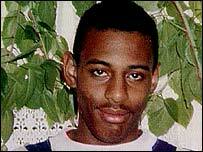 Black teenager Stephen Lawrence, 18, was stabbed to death in London in 1993. Five men - Neil Acourt, his brother Jamie, David Norris, Gary Dobson and Luke Knight - were arrested after the initial investigation but were never convicted. A second police investigation revealed them to be a gang of racists who had an obsession with knives. Aired last week, the BBC's documentary - The Boys Who Killed Stephen Lawrence - accused retired Det Sgt John Davidson of taking bribes from Clifford Norris, father of suspect David Norris. The claims were made by former corrupt detective turned whistleblower Neil Putnam. But in a statement issued via his lawyers on Monday, Mr Davidson said the allegations were false and "extremely upsetting" to him and his family. He said the first and only time he came into contact with Clifford Norris was after the Lawrence investigation. "Whilst leading an arrest team, I arrested him for offences including firearms and drugs," his statement said. "He was subsequently charged and convicted in relation to these offences. Other than in relation to this arrest, I have had no dealings either directly or indirectly with Clifford Norris. "I am not corrupt. I did not hamper in any way the investigation into the death of Stephen Lawrence. "I would like to express my profound sympathies with the family of Stephen Lawrence for any further hurt that these false allegations may have caused them. "I sincerely hope that the killers of Stephen Lawrence are brought to justice."